News in overnight from Bob Cury and Raymond Young at RJC Yachts of a $400,000 price cut on their listing for sale, the 38.4m motor yacht Sea Bear. 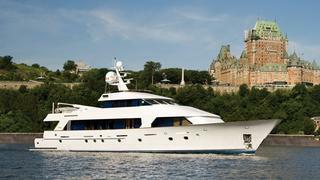 Sea Bear was built by US superyacht yard Christensen and delivered in 1992 as Emerald Isle. She underwent a major refit in 2011 to include complete new exterior paint along with new teak decks and a navy blue window line. Her interior features a four stateroom layout for eight guests including two king size suites (one on deck and one below) and two double queen staterooms – all with en suite bathrooms and entertainment systems. Sea Bear's woodwork is in Brazilian honey teak complemented by granite, marble and onyx highlights throughout. All soft goods were also replaced in her refit along with upgraded electronics and water toys. There is air conditioning and WiFi internet connectivity throughout. She is powered by twin Detroit Diesel 1,040hp engines giving her a cruising speed of 15 knots and a transatlantic range, having completed two crossings on her own bottom. Currently on display at the Newport Charter Show, Sea Bear is down from $4,395,000 to $3,995,000.